Home » Films » Get ready for Get Smart! Get ready for Get Smart! There has been a plan to make the popular spy spoof television show Get Smart into a movie for years. It never seemed to get past the talking stages. Well not only is it past talking, it has started filming. Will it be good? Obviously it is hard to say right now, but there is evidence to suggest it could either be really good, or an absolute turkey. Let us start with the good: the cast. 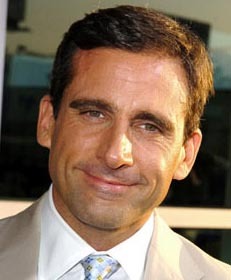 Steve Carell (The 40 year old Virgin, Little Miss Sunshine) is staring as Maxwell Smart. Carell has proven an ability to be funny while not overdoing it. Anne Hathaway (The Devil Wears Prada, The Princess Diaries) will play Agent 99, Smart’s sidekick. Anne has shown she can be funny, I am talking about Princess Diaries, not The Devil Wears Prada. Before you say anything, Princess Diaries was all over cable, it was hard to miss it…besides, it was actually pretty decent. Duane Johnson AKA The Rock (The Scorpion King, WWE) will play Agent 23. Academy Award-winner Alan Arkin (Now doesn’t that sound better than Academy Award-winner Eddie Murphy?) will be replacing Eddie Platt as the head of CONTROL, the agency that they work for. Terrence Stamp (The Adventures of Priscilla, Queen of the Desert, Superman II) will star as Siegfried, an agent of CHAOS, an organization of evil. How much better, for a badguy, can you get than General Zod?? I think the cast sounds pretty darn good. Peter Segal (Tommy Boy, Nutty Professor II: The Klumps) is directing. Segal is responsible for the attroicous remake of The Longest Yard. Now I don’t deny he has had box office success, but I am skeptical that he has the ability to make film that is clever as well as funny. Tom J. Astle and Matt Ember wrote the screenplay. They previously collaborated on Failure to Launch and were executive producers for the sitcom Odd Man Out. Remember that one? Me either. Matt Ember has also written for The Wayans Brothers and Grace Under Fire, while Astle has written and produced Coach. Yuck. So you see, it is a mixed bag. Get Smart is currently filming in L.A., with plans to shoot in Washington D.C. and Montreal, and has a scheduled release date of June 20, 2008.